Last week we ran a story showing off a recent T-Mobile inventory report highlighting a number of handsets T-Mobile was preparing to send to the smartphone graveyard. As it turns out, some of that information was right and some of it apparently, was not. We can’t say for certain why the first report had…what now appears to be incorrect information, but we now have the most recent inventory report which does reflect a few differences from last week. Our best guess is an honest mistake by someone preparing the report accidentally listing everything as “end of life” and not separating them properly as this new report does. So what’s changed? First things first, we’ll notice that the Sensation 4G is now listed as “Sell Through,” which generally means that the phone won’t be in production for much longer but that it could still take months before T-Mobile stops receiving shipments of them. Also marked as “sell through” are the LG myTouch and myTouch Q and myTouch 4G Slide black. Interestingly enough, both the LG Doubleplay and HTC Amaze 4G remain end of life. We still can’t say why that is or what T-Mobile has up their sleeve to replace the it. We’ll continue to emphasize however, that end of life does not mean the end of customer support or that T-Mobile or HTC will no longer provide updates. All recent information points to HTC absolutely releasing Ice Cream Sandwich for the Amaze 4G (and Sensation 4G) in the near future. Also, we should highlight that leaks such as this one are often filled with incomplete information (as is often the nature of leaks), especially since we have no idea what phone will follow-up the Amaze 4G. If we did know the answer to that, the Amaze end of life status may not seem so troubling. In the meantime, we’ll continue to wonder why the Amaze is getting killed off before the Sensation? That is something we’re eager to know an answer to…even so we unfortunately may never get one. We’ll also stay focused on working our own angles to try to uncover what T-Mobile has in the 2012 pipeline, with a doubled effort on figuring out what is replacing the Amaze 4G — and when it’s coming. we have no new phones yet! C’mon T-mo Ninjas! Someone drop a roadmap for phones being released this year…. The Sensation 4g is a great phone. Why does it get so much hate? I love mine, can’t wait for ICS. This I can definitely agree with. My brother-in-law has the EVO3D. I compared it side by side with my now-sold Sensation, and the E3D ran circles around it. I hate you should “OF” idiots. WTF is should of? Grammatically that makes no sense. Should’ve when abbreviated breaks down to should have not should of, jeebus christ. I think T-Mobile has a habit lately of killing phones before their time. The G2 reached end of life quite a while, and not only do I see them everywhere, most people are quite happy with theirs. I still have one, and it still is a great phone, better than any of the current “entry level” phones. The Amaze 4G is practically a brand new phone still, so for it to be at EOL already doesn’t make much sense to me, over the Sensation. We’ll see in time though. I’m glad. The Sensation is by far the worst android phone I’ve ever owned. I’m so fed up with it, I just bought an unlocked Galaxy Nexus. I’m done with this stupid phone. My G1 lagged less. When you say your done with this stupid phone, are you refering to the sensation or the nexus? Just to clarify? Haha, the Sensation. I don’t get the Nexus until tomorrow. I also sold my Sensation and got the GNex, but I think that the Sensation was an excellent phone. If not for the GNex, I would have kept the Sensation. You must have had a better experience than I have. Every time the Sensation runs low on RAM, HTC Sense reloads (white HTC screen, loading circle, then home screen reloading). Unfortunately, that happens every time I browse the web, most of the time I check Facebook, every time I install or update an app, every time I play a game, most of the time I check google reader or do various other things. Sense reloads on me approx 10-25 times every day. It’s gotten to the point where I don’t even update apps anymore because I don’t want to have to wait for Sense to reload. Before you say it, it’s not an app or defective phone, I returned the first 2, this is my 3rd Sensation, all acted the same way and they did it without installing many apps after the first day or two. I even do a full reboot every few days now, still doesn’t help. @MindOverSoul:disqus Then it is time to head over to xda and root your Sensation and be rid of Sense. This is true, and real problem. Aside from that, though (and if, unlike me, you use your phone very actively that’s clearly a BIG aside) I’ve been pretty happy. Hmm… I hate the camera, actually. My understanding (minimal) is that Sense is to blame. I’m getting very very close to loading a different Launcher. Just haven’t had time to explore, install, and configure. Like I’ve said before T-Mobile has been doing this these last couple of years they start off slow with only like 1 or 2 phones then like around March and April they start announcing and releasing lots of big and powerful phones and tablets ,if you noticed nowadays carriers release 2 or 3 devices on the same day instead of every other week. So not to say I’m 100% right but for certain it will happen so stay tuned guys I really would doubt TMO won’t fall short this year and not have a lot up their sleeves especially delivering LTE sometime this year as well. LEGGO!!! I highly doubt you’re going to hear LTE from tmobile until late next year. And the lack of phones thing… as someone already meantioned it, tmobile is in scramble mode because they poorly planned for the at&t merger. The Amaze 4G is a great phone; sad to see it EOL so quickly. T-Mobile/DT bet the farm with this ridiculous sellout and now they’re paying for it big time. T-Mobile needs to rebound fast if they hope to compete. Amaze gets sold off, Sensation becomes the Mid-range android device, and The New HTC viile? becomes the new top dog from HTC? There is nothing impressive about the HTC Ville. It is just another Amaze 4G that lost some weight. Actually, the rumored specs are the same as the Amaze 4G except with a VGA front facing camera. Yep, that’s HTC for ya. I hope the audio recording is FIXED. the sound on Amaze Videos is not good. Reason enough for EOL and a new version. the audio problems will be fixed in sense 3.5. Other users who flash 3.5 roms claim that audio quality during video recording is fixed. Assuming the Amaze really is going to get killed off (I’m always really skeptical of reports like these), I’ll lay odds it’s because of pricing. The Sensation 4G is just a minimally tweaked version of a phone that’s sold all across the world on countless carriers, many of which dwarf T-Mobile US. While similar, the Amaze is a custom design for T-Mobile US that has some high-end parts not in the Sensation, and that drives its cost up, especially given that HTC doesn’t buy those high-end parts in the same quantities. Due to economy of scale, HTC is thus likely able to offer significantly lower pricing on the Sensation to T-Mobile than on the Amaze. This is why T-Mobile would likely keep the Sensation over the Amaze, they can go lower on its price then they can with the Amaze. The Sensation’s customer contract price has already been cut to 149.99 from 199.99, and I expect it will drop even more as the weeks go by. I’m still hoping for the Galaxy Nexus, I think I heard ATT was going to release without the AWS bands mid month. Hope it comes to TMO, don’t really want to buy from outside the US w/out US warranty. My guess is HTC Amaze out and HTC Ville in. 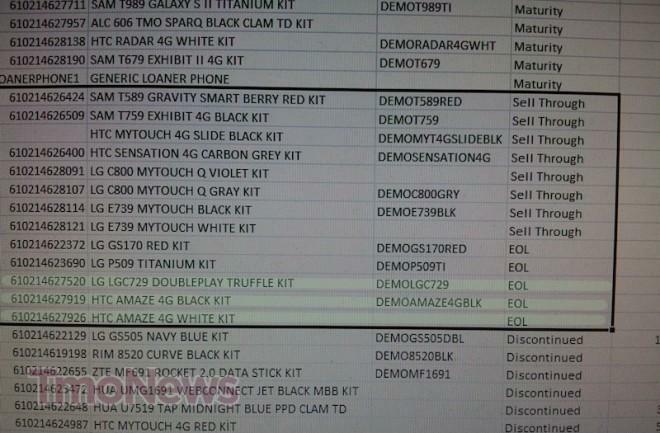 As per a Tmo GNex…i hope it comes w/ the upgraded OMAP 4470 chipset, 32GB internal storage and a bigger battery 2200mAh. Even tho the current camera takes good pics during the daylight or some lighted situations, i must add rapidly as well…wish it was possible to up it to 8Mpx or more. In low light or when u zoom in…the pics are horrible…at least its the case with my GNex. mmm! All HSPA+ 42Mbps phones in TMo are S3 APQ8060s with a Qualcomm radio that supports the above and only compatible with S3 series which made Samsung chose S3 rather than Exynos. So unless Samsung or TI is able to provide a baseband chipset compatible with HSPA42 they cannot call it flagship. So I doubt if this can happen…. You guy’s don’t seem to get the bottom line..and that bottom line is the sales succes of the phone in question….The Sensation was released world wide and has made both HTC and Tmobile more money than the Amaze….To me the Amaze was a combination of the My t 4g slide and a Sensation. These reports are not news to anyone who understands numbers…of course the will CONTINUE to sell through ANY phone that people are still buying….EOL comes to phones that simply didnt do the numbers projected…Reminder…phones that flopped, Last years Nokia Astound…and even the Sidekick by Samsung both flopped in terms of the market place….because YOU personally liked the phone…means little when it comes to money…Plus the amaze never had a chance against the GS2, this is why we’ll see a GS 3….money baby….The money makers dont see EOl as fast as the crappy phones. I hope we get another Motorola soon…nothing since the Cliq 2, come on TMo! you ruined everything you just said in the last sentence. motorola…seriously? t-mobile always gets the crap motorola phones (cliq, cliq xt, cliq 2, defy, charm). unless they all of a sudden get the droid razr or something i hope to never see motorola again at tmo. I don’t get it…T-mobile finally gets a dual-core phone that isn’t plagued by a lot of issues like the G2X and Sensation – and they abandon it. Did T-mobile advertise the Amaze at all? Other than the YouTube vids they did against the iPhone 4s? what are you talking about? What issues “plagued” the sensation? Issues i had, Dust under the screen, shotty wifi that drops signal, Camera never focused up close, screenshots by itself, Sense 3.0 homescreen constantly restarting, crappy speaker audio(tinny noise), Just to name a few, not just me, other people as well, my sisters sensation keeps dropping wifi. Some had no issues, that’s great. Others has lots of issues, not so great. When I called HTC re: issues like random reboots, loss of call control, touch screen lag,wifi dropping, etc.. HTC told me they were known issues. i for one am not surprised .. TMO is known for doing this with their lineup .. release something decent and highly touted .. 3 months later say you have something totally more decent and just keep shuffling them in and out. when you think of TMO what is its flagship phone? anyone? Bueller? exactly. no one friggin knows. is the myTouch? nope not really. the G series? definitely not. and that in itself is what plagues this carrier. it has seemingly NO direction whatsoever with its handsets. Come on TM, drop the price for the Amaze, do it for Johnny. Little Johnny need a new pair of shoes! Johnny say said forget the shoes, just lower th price of the Amaze and he will very happy. The Amaze was overshadowed by the galaxy 2. It should’ve had its own release date. No, I think they did the right thing releasing them at the same time. I had the chance to pick up the S II and the Amaze 4G at the same time and compare them. The build quality of the HTC is what sole me on it. The brighter display on the Galaxy SII was nice, but the higher resolution on the HTC Amaze 4G more than made up of it. My Amaze 4G is still smoking fast. How big is the screen of the Galaxy S Blaze? The HTC Amaze 4G MAXX?